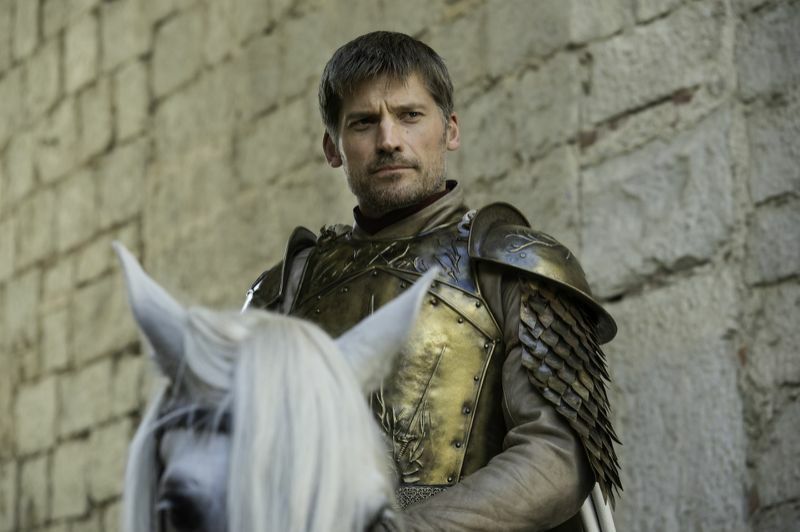 SPOILERS: Don’t read this review if you have not yet seen or don’t want to know details from the latest episode of Game of Thrones. We pick up right where we left off! Bran is still in Warg mode- we see a brief history of Westoros in these flashback scenes. A partially-masked man, wielding a fire mace, on horseback rides up to save Bran and Meera. (I was excited- I KNEW before he revealed his face that he was Benjen!) The man (or should we say Wight?) is the younger brother of Ned and Bran’s uncle. 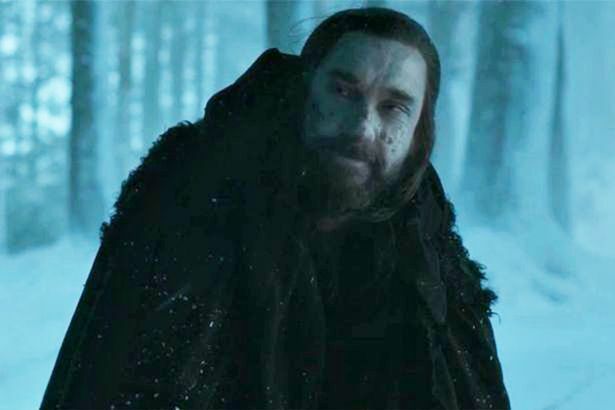 Benjen (Joseph Mawle) was previously a member of the Night’s Watch, much admired by Jon, who went missing beyond The Wall in S1. Sam, Gilly, & Little Sam are in a cart going toward his home. It’s VERY green… & the castle is HUGE (I didn’t expect that)! Sam’s mom (Lady Tarly) and his lil sis (Tala) are SO happy to see him… and sweet to Gilly. 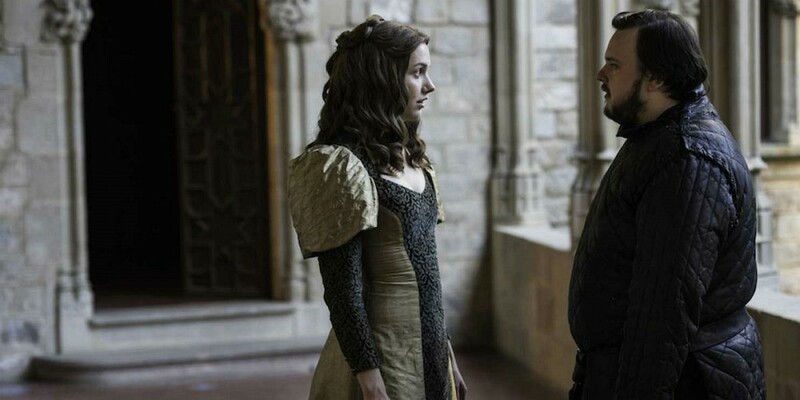 Tommen is chatting w/ the High Sparrow, then he is allowed to see Margaery (FINALLY)! She says that the High Sparrow is “not what we expected” and that he “helped” her realize what kind of person she was. Tommen is a BIT surprised by her words, but looks convinced by her acting (pretty sure she is faking, as were MANY viewers/critics). After Gilly gets her makeover (or Pretty Woman moment, as Nerdette podcast said) we meet the rest of the Tarlys at the AWKWARD dinner scene. Dickon talks re: hunting; Randall fat shames Sam, then keeps cutting him down (as we expected). Notice how the camera focuses on the Tarly fam’s sword (Heartsbane)? It’s made of Valyrian steel- the material that can kill Whitewalkers. When Stand by Your Man Gilly sticks up for Sam, saying that he killed a Whitewalker, Dickon giggles w/ disbelief. Randall quickly uncovers the fact that Gilly is a Wildling- he is disgusted. 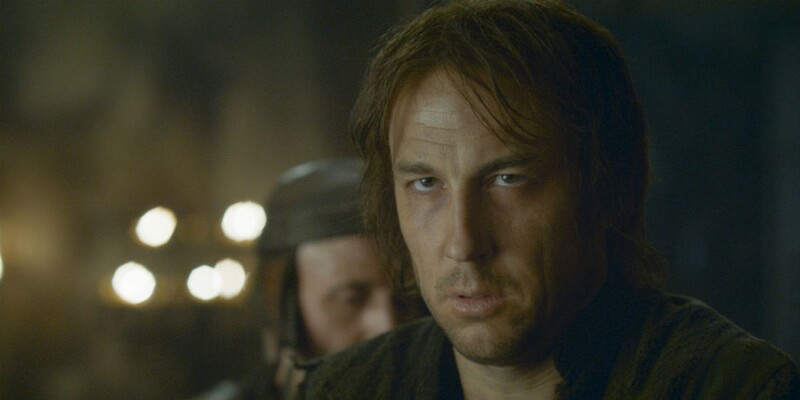 He calls her a “whore,” BUT Lady Tarly is NOT having it! She gets up from the table, taking Gilly and Tala w/ her. Randall wanted Gilly and Sam out of his house, BUT said that he’d let Little Sam be raised up in the Tarly household. Sam thinks that he will leave (alone) the next morning, BUT quickly changes his mind- YAY! We see more of the play- the scene where Joffrey is poisoned. 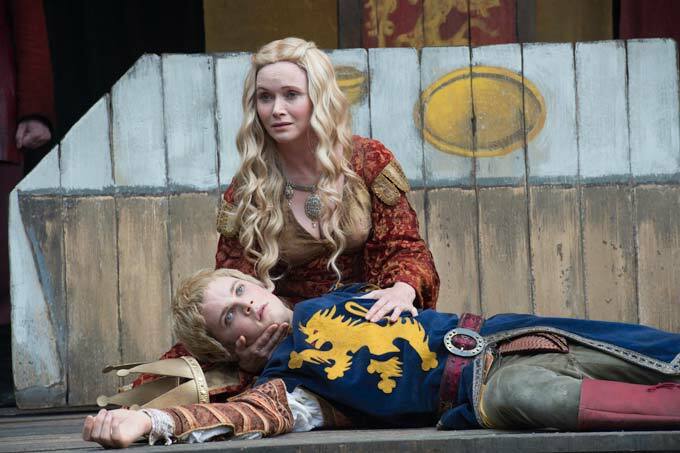 Lady Crane (Essie Davis) as Cersei has a tearful scene by the dead body of her son. Arya admires her talent, as does the rest of the audience. After the play ends, Arya and Lady Crane have a nice convo. She tells the tale of how she became an actress. Then Arya (who goes by “Mercy”) gives her opinion on how to BETTER Cersei’s grieving scene. When Lady Crane tries to express her ideas, the lead male actor (Richard E. Grant) cuts her down w/ spite. 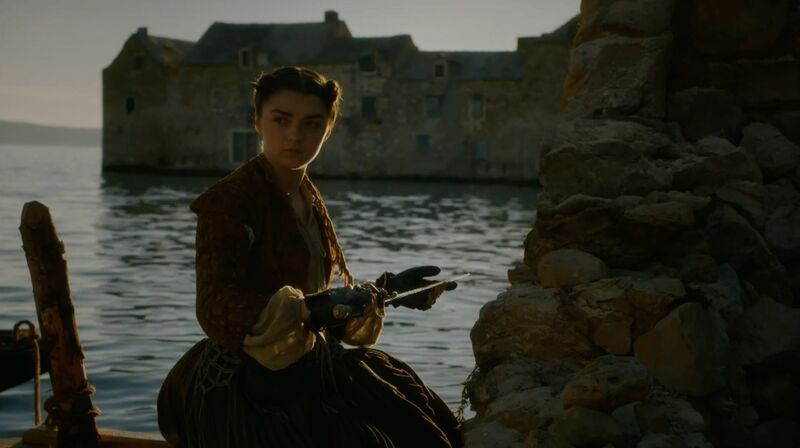 Arya ends up knocking the poisoned cup of wine out of Lady Crane’s hand; she declares that the younger actress wants her dead (which IS true). Then Arya goes to uncover Needle (her sword)- YAY! We know that she has chosen to be a Stark NOT No One (as Jaqen had hoped). She turns out the light; she can fight The Waif in the dark (since she was blind). Mace has a lackluster speech in front of the Tyrell army. Lady Olenna gets out of her cart, watching from the sidelines. 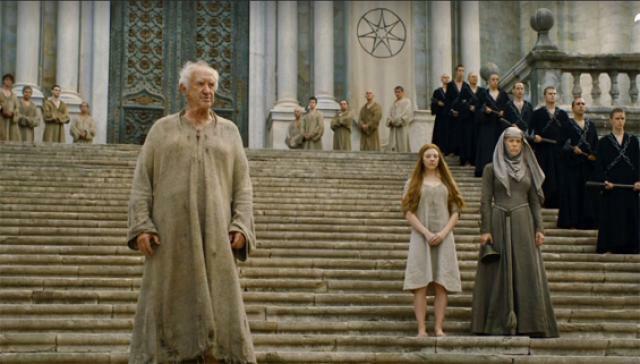 Jaime rides up the stairs (which is VERY cool), then confronts the High Sparrow. The old man says that no blood will be spilled today, Margaery has already been forgiven, and she has converted Tommen to The Faith. Seven Hells (as Robert would swear)! Joanna Robinson (A Cast of Kings podcast) noted that the Kingsguard ALREADY had different armor on (to reflect the union of the crown and The Faith). We see Walder Frey (David Bradley) again- YAY! He berates two of his sons, who have lost Riverrun to Blackfish Tully (Catelyn’s uncle). And guess who’s just out of jail? It’s another uncle you’d been wondering about- Edmure Tully (the always FAB Tobias Menzies)! Tommen fires Jaime from the Kingsguard, much to the knight’s shock/anger. A bit later (in Cersei’s chamber)- we learn that Jaime has been ordered to go to The Riverlands to capture Riverrun from Blackfish! Walder Frey needs Lannister help, and they have debt to pay. 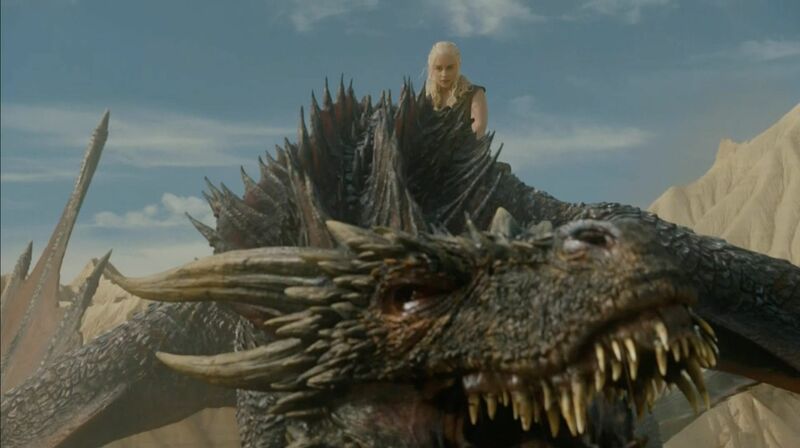 We see just how BIG Drogon has gotten (CGI budget must’ve been quite HIGH)! Dany rides away on her white horse, BUT comes back on one of her dragons. The Dothraki are wowed (yet again), then she gives them a rousing call to action speech. Hey, Dany had to get her khalasar motivated to cross The Narrow Sea (when they have fear of water).